PLAY: my 2016 word of the year. Not pray. PLAY. Not that I'm not going to not pray, because I most definitely want to do that. 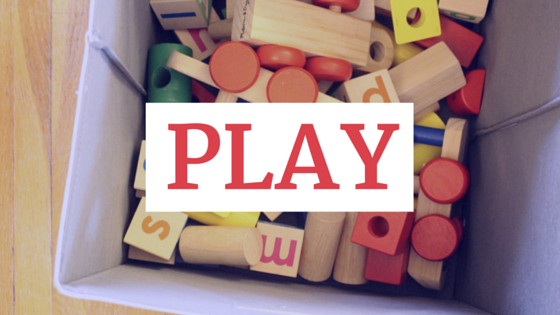 But something I want to be better at, more intentional at is PLAY. Every year I make it a habit to choose a word of the year. Last year I got side tracked and chose a phrase. The year before that my word was RETURN. The year before that I can't really remember. All you need to know is this is what I like to do. I used to write down lots of goals at the beginning of the year. I think those are great for some people but not for me. I'm forgetful. I lose things. I don't follow through when it's too long to remember. I like simple. This year I chose PLAY because I want to be more intentional in playing with The Rose. I want to play on her terms, in her fashion, with her imagination in mind, not just what I think it looks like for a Mama and baby girl to play together on a Monday afternoon. I want to watch her creativity come to life whether it's through a cup of warm tea (that's not really warm tea, but pretend tea) being poured for me on our living room floor or whether that's drawing pictures of (what is supposed to be) Daddy (but really looks like a bunch of lines). I want to be more willing to let myself die to serve her needs, rather than being caught up in what I want to do and what I want to clean and what I want to get done in a day. I'm not saying I'm giving up on keeping a tidy home, because that my dears is still pretty important in our home, but I do want to be more willing to take a time out from the tasks and PLAY with my little girl. I also want to be more playful in my conversations with Mr. Christopher. Life has been so hard lately. We've become too serious. We need to let loose. Have fun. Stay up late and eat chocolate for dinner. He needs to be teased and tickled and told that he's hilarious. Because Dad jokes aside, he really is! And I need to be more playful with myself. I need to let myself make mistakes. I need to risk big and try new things and hang out with friends that are weird and be adventurous in my own skin. My heart basically needs to calm down and relax and be more playful. That's what it is. And that's my word for the year. Hold me to it, friends!